I really enjoyed making this pattern. It's quick and fairly straight forward, so a beginner/intermediate sewer should find it a simple one to sew up in an afternoon. I've been getting lots of wear out of the blouses I've made and already have plans for some other variations for this blouse. 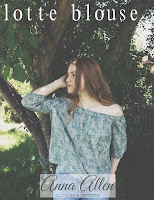 I keep seeing these off-the-shoulder style blouses pop up all over the place and I think they are so easy to make. There's no need to buy one already made if you can sew! 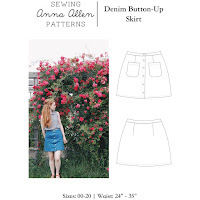 If you are interested in sharing photos of your creations using my patterns, I would love to invite you to join my Flickr sewing group and post pictures! I am working on more sewing patterns and hope to have them added to my collection in the coming months! If you would like to receive emails when I come out with new sewing patterns or clothing collections, feel free to join my mailing list for updates!